Listen to me, you that pursue righteousness, you that seek God. 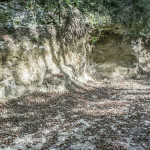 About 9-10 kilometers from Chartres (five to six miles) is the original quarry where most the stone used at the cathedral was extracted. 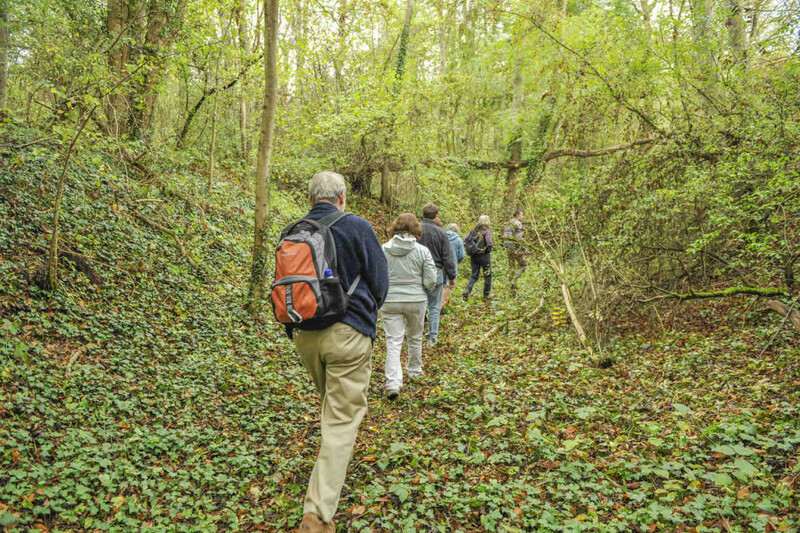 Walking from the quarry to the Chartres Cathedral requires a sturdy pair of shoes, water, and perseverance. If your health allows, it can be a very meaningful to watch the cathedral come and go on the horizon. It is possible to visit the quarry. Snacks. If you are walking on Sunday, there are no stores or restaurants open along the route. In France it is legal to walk on the dividers between crops. You are obviously not allowed to enter any planted areas. Two IGN maps will help you to choose your route. You can get these on-line or buy the “cartes bleues” maps at most any bookstore in France. Most useful is the one for Sours (2117 0). You may also want the one for Chartres (2116 0). The tourist office can help you fnid a bookstore in Chartres. 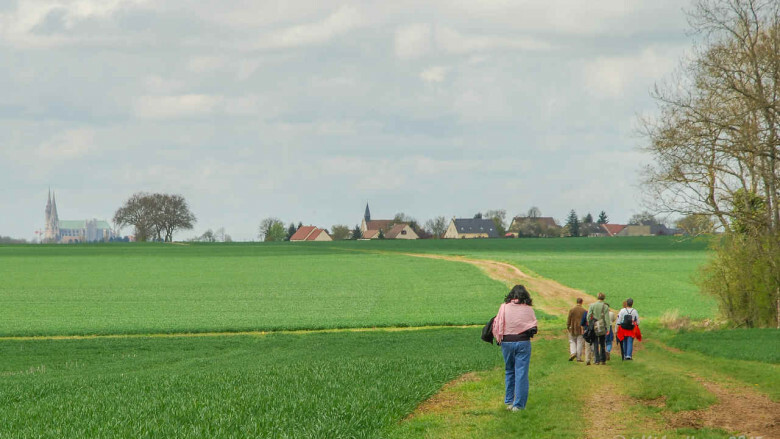 The “route des pierres” (the way of the stones which was used in the middle ages) begins on a field road out of Bechères-les-Pierres heading towards to Gellainville. 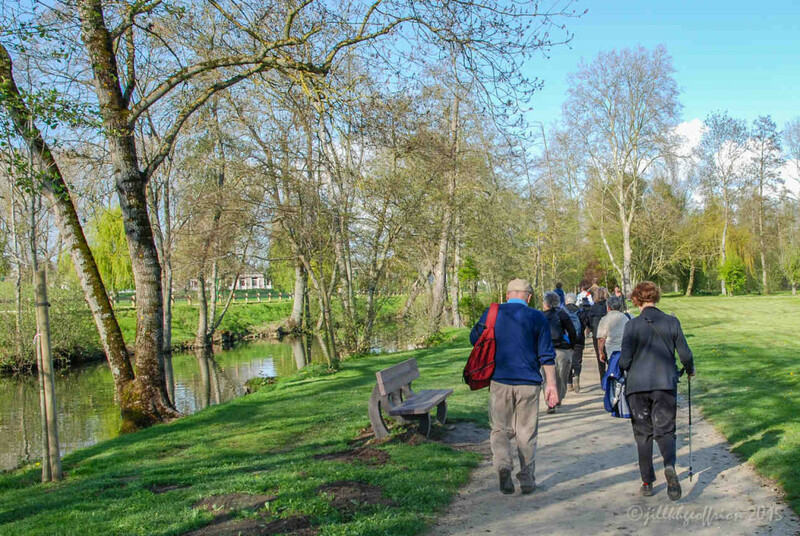 From there you can walk along the road D-339-7 to Le Coudray and pick up the walking path beside the Eure River. Some have told us they find this route a bit harrowing because of the need to walk on the shoulder of a busy road. Berch-Pierres has been working on an alternative and more historically accurate route which I hope will be posted on their website eventually. To get to the quarry once you are in Berchères-les-Pierres,, take rue des Carrières out of town about 1 kilometer. You will enter into a wooded area. After about 200 meters you will see a moto-cross track on your right. That’s where the stones for the cathedral came from. One the left you will see signs that will guide you to the walking paths through the quarry. While walking between Berchères-les-Pierres and Chartres, you also walk on part of the Chemin St. Jacques (the Camino) which leads between Chartres and Compostela, Spain. There are shell markers which show this connection. 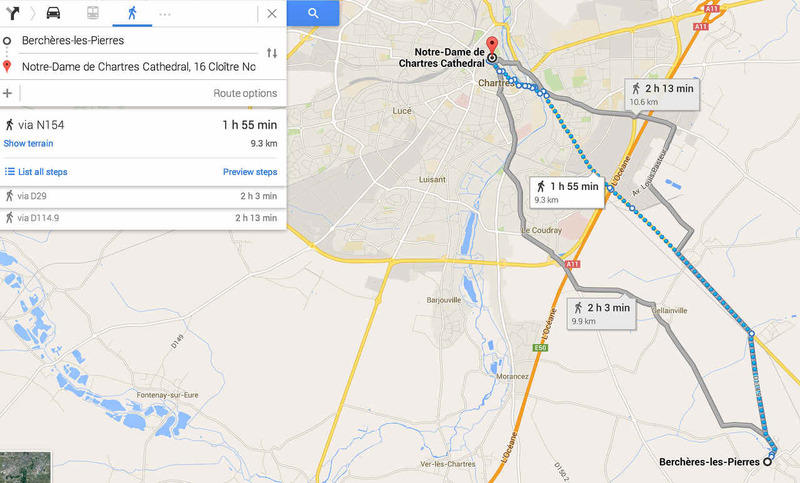 You may want to walk to the quarry and back to Chartres, or you can bike there. It is also possible to get a taxi (you can find them by the train station) to take you there. 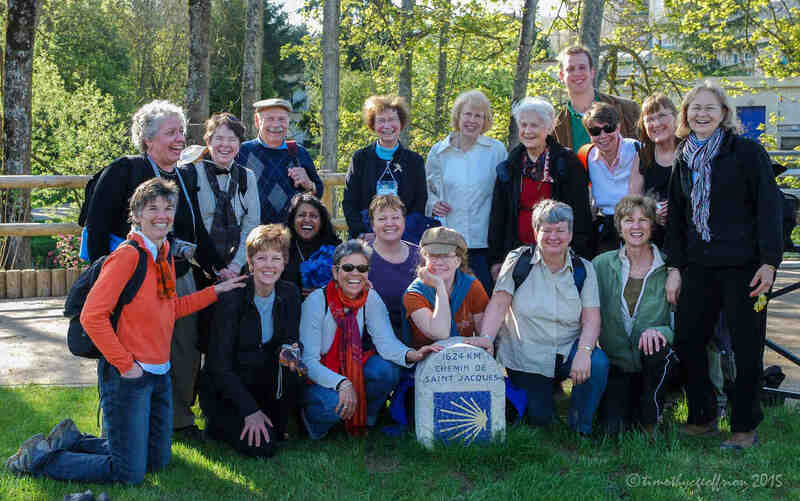 Members of Berch-Pierre have been incredibly hospitable to us and the pilgrims we have brought to the quarry. 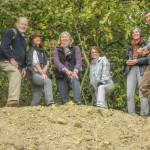 In 2006, the mayor’s office first put me in touch with François Bonny, now President of Berch-Pierre (and owner of a charming B & B in Chartres) who has spearheaded efforts to make the quarry more accessible to the public. He delights in answering questions about the quarry. His enthusiasm is infectious! 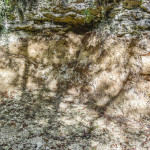 The limestone from this site grows harder with age. Block by block it was extracted from this quarry and then transported by cart to the cathedral. “…it was the work on the cathedral that allowed the people to show their zeal for the glory of Notre-Dame. 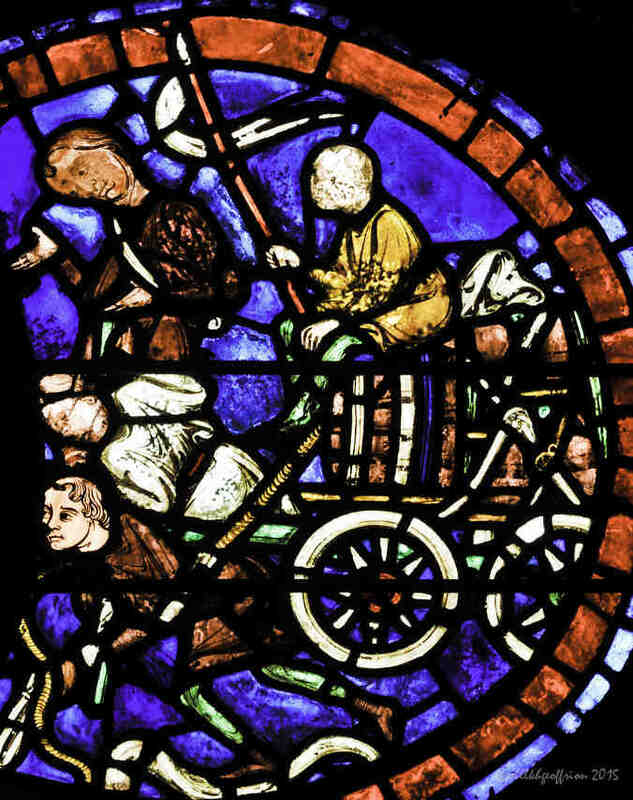 Contemporary texts, which are often cited, speak of the chariots that went to Chartres with materials for the cathedral and also for the workers. No one was admitted to the honor of moving the carts without first confessing their sins. The convoys went forward in the day while people sang songs. Night, when people would stop, was consecrated to rest and prayer. Therefore, while it seems as if the building raised itself, the genius of the architects was served by the enthusiasm of the people.” Chanoine Delaporte and Monseigneur Michon (Introduction) (1957), Notre Dame De Chartres (Paris: Librairie Hachette). Pages 15-16. Then, receive the same blessing from the other pilgrim. You may want to sing, We are pilgrims on the way to God, we are pilgrims on the way with God (Tune: We are marching in the light of God). 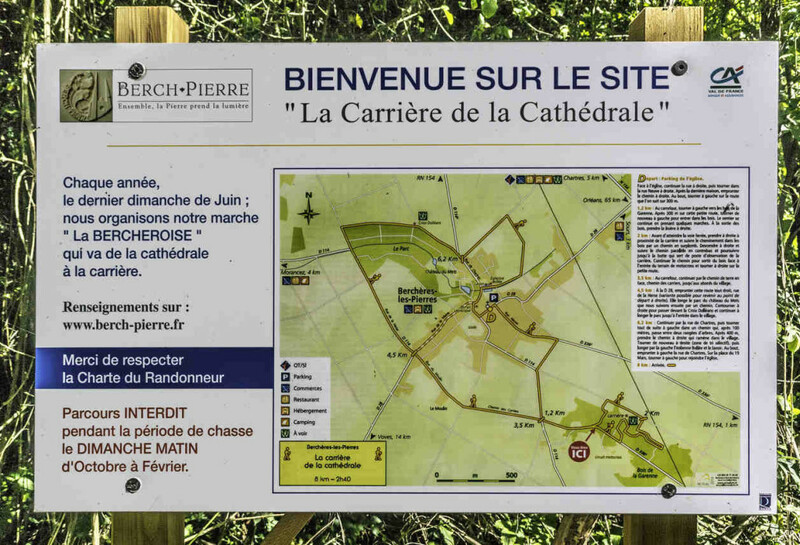 As you move towards Chartres from the quarry, imagine yourself as a stone, stone-carrier, or someone or something else involved in transporting the large stones to the cathedral site. Allow you imagination and prayer to carry you into a deeper relationship with the cathedral and those who built it. Be sure to walk in silence for at least part of the way. This will help you to stay in touch with your intention for this pilgrimage, whatever it may be. Be in touch with the cathedral. It will come and go on the horizon. Feel your excitement. Feel whatever comes up as you see it and it disappears. Be attentive to your inner states. It is not uncommon for pilgrims to sing or pray together, so if this is something you want to do, suggest it to those you are walking with! When you arrive at the cathedral walk all the way around it to prepare yourself to enter it with fresh eyes. Adams, Henry. (1989). Mont-Saint-Michele and Chartres. Princeton, NJ: Princeton University Press. Delaporte, Chanoin, & (Introduction), Monseigneur Michon. (1957). Notre Dame de Chartres. Paris: Librairie Hachette. Mende, Guillaume Durand de. (1996). Manuel Pour Comprendre La Signification Symbolique des Cathédrales et des Eglises. Lugrin: La Maison de Vie. Marchant, Jean le. (1973). 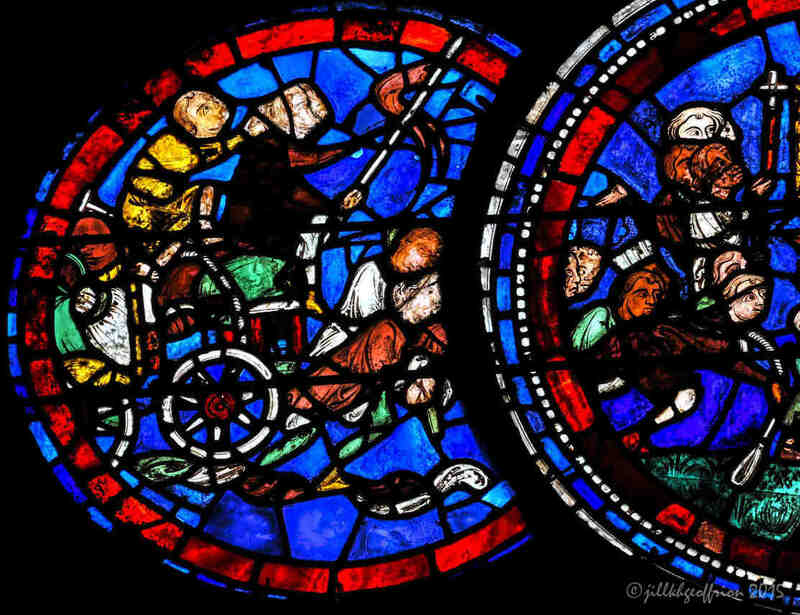 Miracles de Notre-Dame de Chartres. Chartres: Société Archéologique d’Eure-et-Loir. See Miracles 10, 11, 12, 15, 17, Marchand pp. 112-17, 118-23; 124-26; 136-139, 145-48.